This newly renovated, private guest space has a bedroom with vaulted ceilings on the upper level and a living room/kitchen downstairs. With its own kitchen, the Studio Suite offers an extended-stay option to guests. Many locally sourced materials such as cherry, maple, stainless steel, marble and granite are used throughout. Suite includes a queen-sized bed, full-sized pullout and optional roll-away twin. You will enjoy the radiant heating in the winter and the AC in the summer. 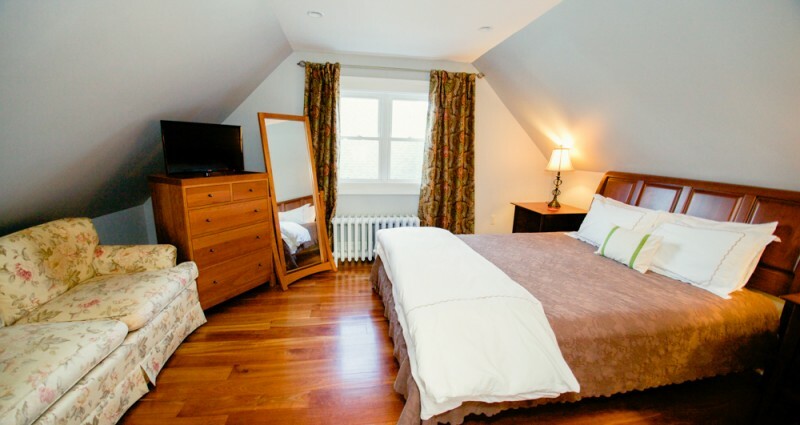 Featuring local cherry wood floors, the Tower Suite provides a couple or family with private quarters. The Suite consists of two separate rooms – one with a queen bed and the other with two twin beds set in the eaves of the home’s peak. The luxurious bathroom towers over Main Street, delighting guests with a Jacuzzi tub and shower/sauna combination. 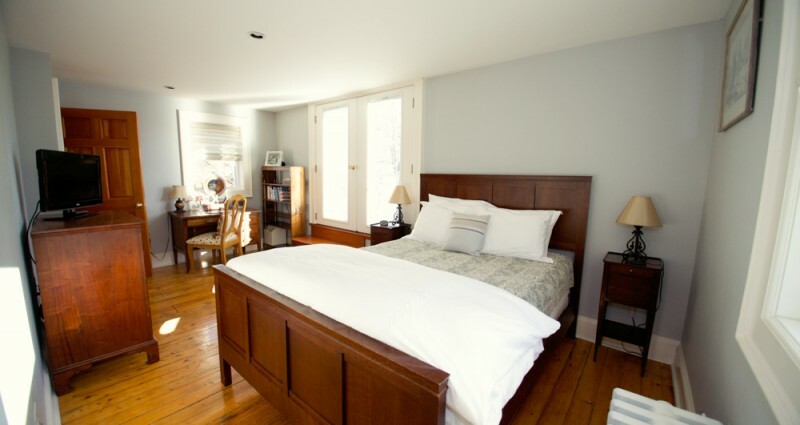 The original spruce hardwood floors in this room show the charm of this century-old house. With a unique wrap-around layout, the Rouse Room is tucked away on the backside of the house and offers a deluxe Queen bed and private en suite bathroom with a shower, decorated in green marble. The closet and wooden desk, bookshelf and dresser make guests feel right at home in this cozy corner of the house. French doors open onto a small balcony, part of a spiral staircase fire escape constructed out of iron from the days when fabricators were prolific in upstate New York. Decorated in soothing greens and country quilts, the Master Suite is a spacious room ideal for families or multiple guests. The Suite consists of two separate rooms furnished with cherry-wood furniture – one room with a luxury four-poster Queen bed and the other with a day bed. 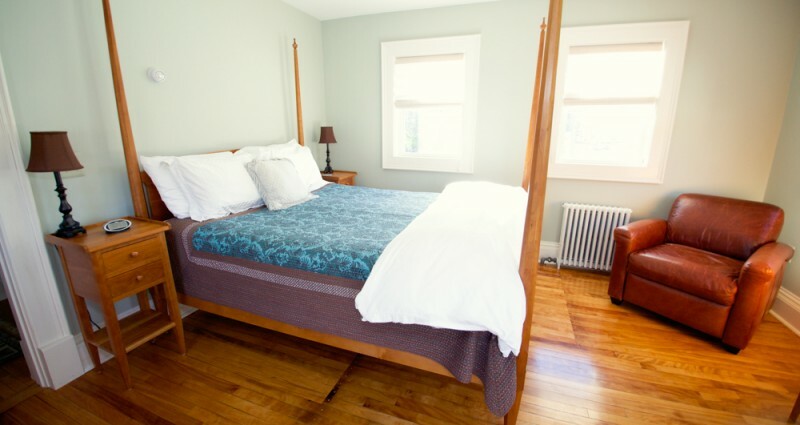 The room has one large closet and a private bathroom with a Jacuzzi tub/shower combination. 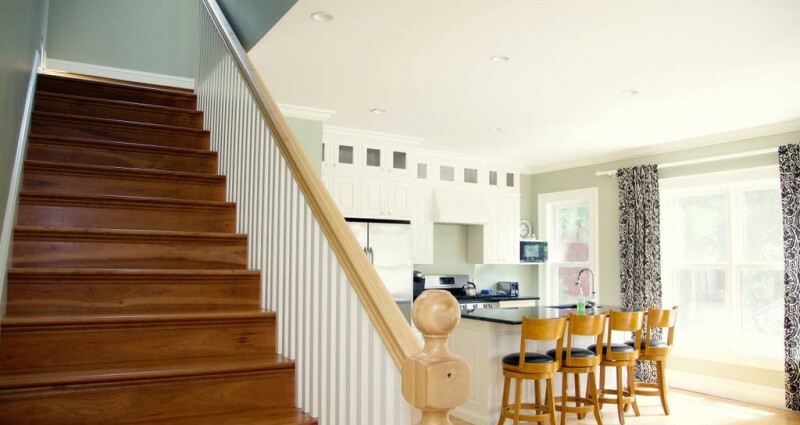 The attractively restored maple floors date back to when Canton was a lumber town. A shared balcony is accessible from the suite and offers a spectacular sunset view. 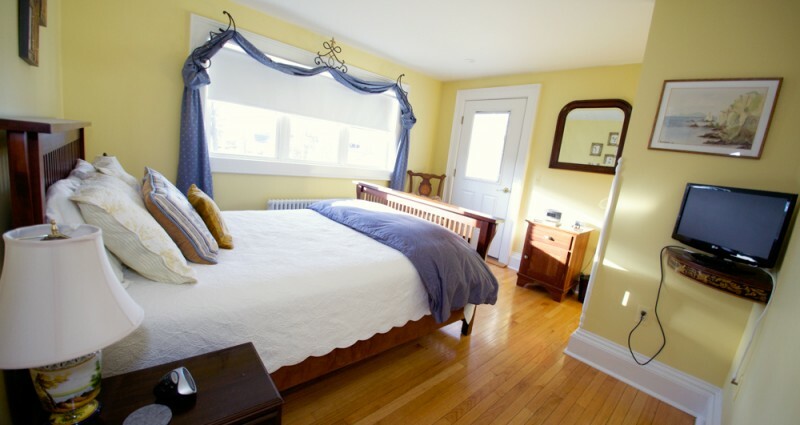 Facing west, the Fleur-de-Lis room is a warm and sunny haven with a closet and queen size bed. A private entrance onto a shared upstairs balcony offers the best sunset view in the whole house. Handmade tiles of local Potsdam sandstone have been incorporated into the décor of the bathroom with a bathtub/shower combination. It’s hard to believe that 24 East Main opened eight years ago (August 2008). A home renovation that took four years to complete has now hosted thousands of guests and seen Juniors in high school choose one of the four local colleges, and then graduate! We have been thrilled to be the subject of local news on a few occasions, first when we opened in an article in the Watertown Daily Times, and some fun history on 24 East Main from when we hosted the EJ Noble Guild’s House Tour in 2010. That article is here. 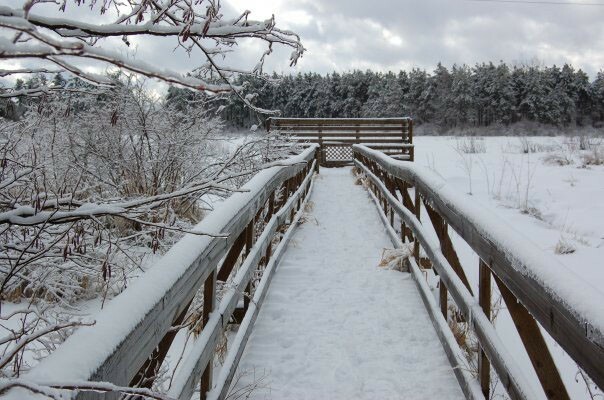 Living in the North Country requires you to embrace winter – it’s a long season! There is nothing quite like the sun shining on a field of snow, the twinkle of the ice coated branches or the feeling you get on a perfect flurry day that makes you feel like you are living in a snow globe! We are also very fortunate to have extensive winter adventure, literally outside the back door. The St. Lawrence University golf course is a great spot for cross-country skiing (Charles went over 100 times in 2014-2015), with groomed tracks on occasion. Not far away there are snowshoe adventures to waterfalls, and ice skating at the local pavilion. One of the best parts about running a B&B is the cooking and baking! It’s so much fun to get creative in the kitchen. 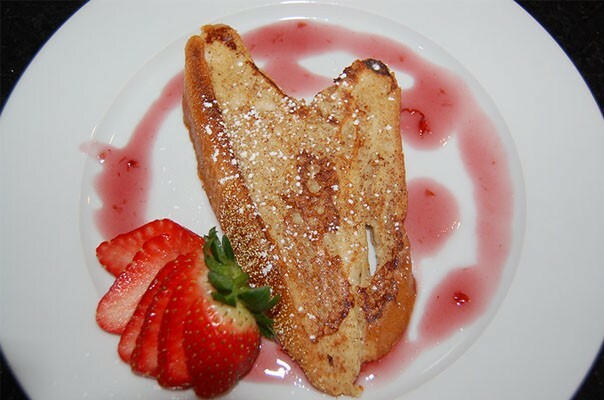 Some think that breakfast is a limited culinary opportunity, however, we indulge in the opportunity to prepare and serve all home cooked, fresh from recipe specialties; A multi-step pancake recipe, an over-night waffle batter, coffee cakes with local fruit, and fresh farm eggs in many styles all make what we do enjoyable – and a real treat for our guests. 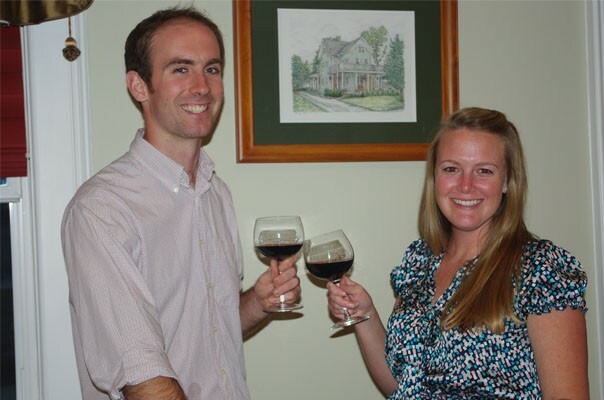 Charles and Brooke were both raised in families with professional (and self-proclaimed) chefs, which certainly had an influence on their handy work in the kitchen at 24 East Main.